With the recent increase in property crime in our area, it has never been more important than it is right now to participate in Neighborhood Watch (NW). The police can’t respond if they don’t know something is happening. 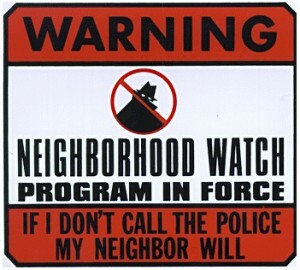 Neighborhood Watch is like their advance warning system, allowing early action and dramatically increasing the chances of either preventing a crime or apprehending the perpetrators. So what is NW exactly? How does it work? Will I have to take a “shift” and walk up and down my block? Who do I contact for more info? First, NW is merely the organizing of a small subset of the neighborhood, usually by block. Someone volunteers to be the Block Captain, and it’s up to that person to gather the names and contact info of everyone on their block. As alerts come in, the Block Captains can immediately disseminate to the group via an email blast or other speedy form of communication. You do NOT have to take a “shift” on your block. But what you SHOULD do is be aware anytime you’re outside or have a view from a window outside. If you’re walking your dog and see a strange vehicle with someone sitting in it, or you see strangers going door to door or taking a little too much time looking around, that’s your cue to start taking some mental notes of what’s going on so you can report it to the police. If that car is in front of a neighbor’s house – call them!! Do they know who owns the car? Is it a friend or a contractor? Knowing your neighbors makes this all possible. That’s Neighborhood Watch in its purest form. So, how do you get more info and get a NW block going? There are some links below that will help, and our local Neighborhood Watch guru is Cyndi Hench. Send her an email at wpdrnw@aol.com. There may already be a block captain on your street – she will know.